Have you ever had one of those projects that seems to spiral out of control? "Well if we do this than we really should do that, and if we're doing that we might as well do this" Then before you know it, a little project is a really big project. Well, I'm determined to make the master bath reno, NOT ONE OF THOSE PROJECTS. I've never loved the bathroom floor, I'm not sure how many people really "love" their bathroom floor but that's besides the point. The grout is not dirty but has literally yellowed over time, so I could scrub all day and its never going to get white again. I have 3 options here, 1. Rip out the entire floor and put in a new tile that I do love. 2. Sand out all of the grout and regrout, or 2. 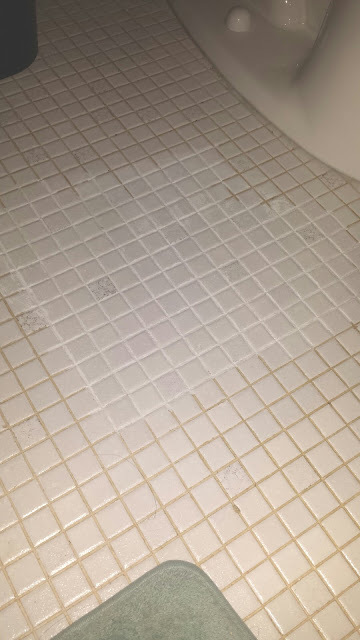 Paint over the old grout with fresh white paint. Well as much as I would love to go with option 1, Its. Not. Gonna. Happen. This floor was set in 2 inches of cement, yes 2 inches. We had to build back up the floor under the new vanity. So I'd have to be crazy to want to take a sledge hammer to that, no to mention get rid of it once its removed. I went with option 3. 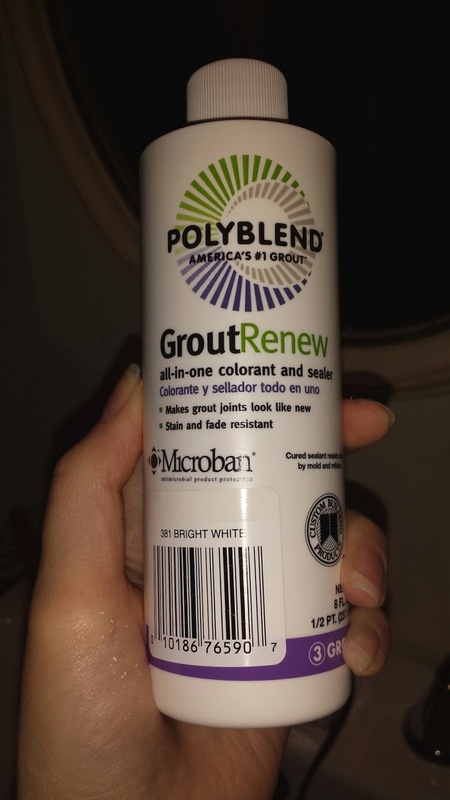 I pick up this grout pain and sealer from Home Depot, I think it was like 8 bucks, but I'm just guessing. The bottle could do ever grout line in my entire house if I wanted to, a little goes a long way. I wanted to start in the shower. The first 2 feet or so of the shower is permanently stained, trust me I have tried everything, from bleach to acid, and every "miracle cleaning solution" of Pintrest, yeah its never getting white again either. But the product needs 72 hours to dry before getting wet, so I have to plan accordingly. I started on the floor, I used a small paint brush from one of those kits that come with like 20 bushes for 5 bucks, and just painted the seams, it will stick to tile so you want to wipe off the extra before it dries. It's truly a less than thrilling job, especially with the amount of grout lines I have, but at the end of the day, it's going to be totally worth it! It makes the floor look brand new! I have to admit, I couldn't resist trying a little bit in the worst part of the shower, its the back corner so it will stay pretty dry, and it looks like I'm going to need about 3 coats to really cover the stains, however still better than alternative 1 and 2. I'll post my shower before and after's, I hope it will all look uniform after I'm done, but anything is better that what I currently have.